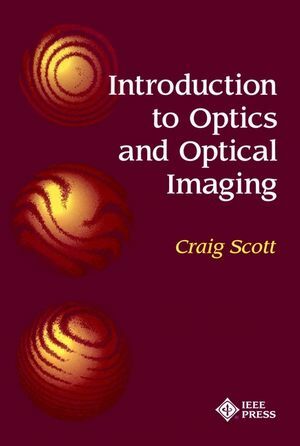 "With a focus on providing a working knowledge of optical systems and their principles of operation, this book employs today's most important methods for optical analysis: geometrical ray optics, raction integral techniques, and the Abbe plane wave spectrum technique. This thoughtfully organized text uses fundamental electromagnetics as its underlying framework, allowing for a comprehensive understanding of both classical and modern optics theory. Understanding the theories presented in this book is an essential step for readers who want to produce effective design using current software. The author has carefully incorporated practical mathematics throughoutfor readers who want to further their analytical understanding of the material. INTRODUCTION TO OPTICS AND OPTICAL IMAGING will be an indispensable guide for advanced undergraduate engineering students, practicing engineers, and optical scientists seeking a comprehensive background in physical optics." About the Author Craig Scott has been at Northrop Grumman Corporation since 1995. He is presently working in the areas of conformal antennas, frequency selective surfaces, and photonic bandgap structures. Prior to that, Mr. Scott worked at Rockwell International in the areas of printed phased array antennas and frequency selective surfaces, and at TRW in the areas of reflector antennas, method-of-moments software development,and frequency selective surfaces. He is the author of three other books on electromagnetics and optics. ELECTROMAGNETICS FOR OPTICS: THREE VIEWPOINTS. Foundations of the Diffraction Integral Method. Foundations of the Plane Wave Spectrum Method. LENS ACTION FROM THREE VIEWPOINTS. Focusing and Imaging Properties of Lenses: Ray OpticalViewpoint. Focusing and Imaging Properties of Lenses: Diffraction IntegralViewpoint. Focusing and Imaging Properties of Lenses: The Plane WaveSpectrumViewpoint. Applications of the Plane Wave Spectrum Concept: Introduction toDiffraction Gratings. Introduction to Optical Moire Techniques. INTRODUCTION TO OPTICAL INFORMATION PROCESSING. A Sampling of Optical Information Processing Systems Based onFourier Plane Filtering. Appendix A: Elements of Vector Analysis. Appendix B: Theorems and Relations from Fourier Analysis. Appendix C: Vector Calculations in Source and FieldCoordinates. Bessel Functions of Integer Order.